《★【用法】 (1) be は語形変化をする ⇒表; (2) be の形は (a) 助動詞のあと，(b) 不定詞，(c) 命令法・祈願法，(d) 仮定法で用いるが 《⇒動詞 B の項またはそれぞれの項参照》, 動詞 be の共通の用法は次の A 参照》. He's a good doctor. 彼はりっぱな医者である. Twice two is four. 2×2は 4. It's me. 私です (⇒I３ 代名詞【比較】). That's what I wanted to say. それが私の言いたかったことです. I'm quite well [in good health]. 元気です. We're the same age. 私たちは同じ年です 《★【用法】 the same age の前に of を補いうるが, 現在では of を用いないほうが一般的》. The house was on fire [in flames]. その家は燃えていた. To live is to fight. 人生は戦いなり. Seeing is believing. 《諺》 「百聞は一見にしかず」. The trouble is that she does not like it. 困るのは彼女がそれを好まないことだ. What is important is how they get along together. 重要なのは彼らがいかに仲よくやっていくかということだ. The question is not what to do but how to do it. 問題は何をなすべきかではなくていかになすべきかだ. It is /íz/ wrong. 確かに間違っている. “Where is Hokkaido? "—“It's in northern Japan." 「北海道はどこにありますか」「北日本にあります」. “When is your birthday? "—“It's on the 5th of May." 「誕生日はいつですか」「5 月 5 日です」. This switch is to turn the power on. このスイッチは電気を入れるためのものだ. This is to certify that… これは…ということを証明するものである 《★証明書の言葉》. Come back before it is dark. 暗くならないうちに帰ってらっしゃい. I'll go if the weather is nice. お天気なら行きます. What a long time they are! 彼らはなんて遅いんだろう[ぐずぐずしているね]. [there is [are]… で] 〈…が〉ある (⇒there B1). There is a book [are two books] on the desk. 机の上に本が 1 冊[2 冊]ある. Troy is no more. トロイは今はない. I think, therefore I am. われ思う, 故にわれあり. The exam was last week. 試験は先週あった. 〔+補語〕[未来を表わして] 〈…に〉なる (⇒A3a; become 【語法】 (2)). He will be a doctor. 彼は医者になるだろう. It will be dark before long. まもなく暗くなるだろう. Will you be long? 長くかかりますか. When will the wedding be? 結婚式はいつ行なわれますか. That may be true. それは本当かもしれない. Can such things be? こんなことがありえようか. Let it be so! そうあれかし. Let him [it] be. 彼[それ]を放っておけ. To be, or not to be: that is the question. 生きていくべきか死ぬべきか, それが問題だ《★Shakespeare 「ハムレット」から》. Be kind to old people. 老人に親切にしなさい. So be it!＝Be it so! そうあれかし. Do be quiet! 静かにしてください 《★【用法】 強調のための do の用法》. If it be so… そうならば… 《★【用法】 現在は通例直説法を用いる; ⇒be A3a》. Be it ever so humble, there's no place like home. いかに粗末であろうともわが家にまさる所はない. Be that as it may, …. それがどうであろうと…. Be the matter what it may, …. 事がどうであろうと. I demanded that he (should) be present. 彼の出席することを要求した 《★【用法】 should を用いないことが多い》. Resolved (＝It has been resolved) that our salary be raised. 俸給を上げられたし, 右決議す. [be+他動詞[受身可の句動詞中の自動詞の過去分詞]で受身を作って] …される 《動作》, …されている 《状態》. This magazine is published twice a month. この雑誌は月 2 回発行される. He is known as a leading poet. 彼は一流の詩人として知られている. She is singing now. 彼女は今歌っている. [always，constantly，all day などを伴って; しばしば非難の気持ちが含まれて] たえず[ひっきりなしに]…している. He's coming to see us this evening. 彼は今晩我々に会いにやってきます. I must be going. もう行かなければなりません. ⇒be GOing to do 【成句】. [be 動詞が進行形をなして] …している(ところだ) 《★【用法】 元来 be は静的状態を表わし進行形で用いられないが，特に一時的な行為の面を強調する時に用いる》. “Be serious! "—“I'm being serious." 「まじめにしなさい」「(ちゃんと)まじめにしていますよ」. Aren't you being too easy with him? 彼に甘すぎるのではないですか. We're to meet at 5. 5時に集合することになっている. He was to have arrived at 5. 彼は 5 時に到着することになっていたのだが(まだ到着していない) 《★【用法】 完了不定詞をとると実現しなかった予定を表わす》. I'm to inform you that… …をご通知申し上げます. You're not to use my computer. 私のコンピューターを使ってはいけない 《★【用法】 否定文では禁止を表わす》. [可能を表わして] …することができる 《★【用法】 通例 see，find などの受身の不定詞が伴う》. No one was to be seen. 人っ子ひとり見えなかった. He was never to see his homeland again. 彼は再び国に帰らぬ運命だった. [were+to do で実現性の乏しい仮定を表わして] 仮に…だとしたら 《★【比較】 should よりも不確実を表わす意味が強い; cf. should B5a》. If I were to die [Were I to die] tomorrow, what would my children do? あすにも私が死ぬとしたら子供たちはどうするだろう. [be+自動詞の過去分詞で完了形を作って] …した，…している 《★【用法】 運動または変化を表わす自動詞 come，go，arrive，rise，set，fall，grow などの場合; 今は完了形は ‘have+過去分詞' に統一され，‘be+過去分詞' は動作の結果としての状態を表わすが，例のような go の場合を除けば 《詩語》》. Winter is gone. 冬は過ぎた 《cf. He has gone out. 彼は出かけた(ところです)》. This is a new type of jazz. Yokohama is a big city. My name is Takuya Ishii. “Can I talk to John, please? "“It's me." Mr. Kobayashi is the new leader of our group. The purpose of this lecture is to analyze films. A theory is a set of related concepts. She was kind enough to give me her seat. My room is rather small. There is a new restaurant around here. There is still snow on the roof. Our economy is in a terrible condition. The next match will be at 3. He insisted that she be here. It is natural that the monkey be sent back to the forest. Taro is running in the rain. We're leaving here next Monday. Water is broken down into oxygen and hydrogen. The bridge will be destroyed by the time we arrive there. The store is closed at eight. Winter is gone and spring has come. He is to be back here at 3:00. He is to leave at dawn. You are to do what I ask. She is to be the first woman President in our country. This is to be a very formal presentation. You're always buying her something. I'm living in Paris right now. He was killed in a traffic accident. ポイント 《A BE B》においてBの空間の中にAが位置づけられる関係が示される.《A HAVE B》とちゅど逆の関係になる.Pat is a teacher. だと「先生という範疇(B)」,Pat is happy.だと「幸せという状態(B)」,Pat is running.だと「走っているという連続的動さ(B)」,Pat is beaten by Mary.だと「メアリに叩かれた」という完結した状態(B)にパット(A)が帰属することになる. My name is Takuya Tanaka. "Can I talk to John, please?" "It's he." Mr. Yamada is the new leader of our group. The purpose of this course is to analyze films. The town is three miles away. Belgium ベルギー《ISO の 2 文字コード》. (banking) Initialism of bill of exchange. From Middle English been (“to be”). The various forms have three separate origins, which were mixed together at various times in the history of English. The forms beginning with b- come from 古期英語 bēon (“to be, become”), from Proto-Germanic *beuną (“to be, exist, come to be, become”), from Proto-Indo-European *bʰúHt (“to grow, become, come into being, appear”), from the root *bʰuH-. The forms beginning with w- come from the aforementioned 古期英語 bēon, which shared its past tense with the verb wesan, from Proto-Germanic *wesaną, from Proto-Indo-European *h₂wes- (“to reside”). The remaining forms are also from 古期英語 wesan (“to be”), from Proto-Germanic *wesaną, from Proto-Indo-European *h₁ésti, from the root *h₁es-. (intransitive, now literary) To exist; to have real existence. Rachel wepynge ffor her chyldren, and wolde nott be comforted because they were not. To be, or not to be, that is the Question […]. […] it were great sottishnesse, and apparent false-hood, to say, that that is which is not yet in being, or that already hath ceased from being. There is surely a peece of Divinity in us, something that was before the Elements, and owes no homage unto the Sun. The genial hotel manager of the past is no more. Now owner of a trucking concern and living in Belgium, Rusesabagina says the horrors he witnessed in Rwanda "made me a different man." (with there, または dialectally it, as dummy subject) To exist. Some men there are loue not a gaping Pigge: / Some that are mad, if they behold a Cat: / And others, when the bag-pipe sings i’th nose, / Cannot containe their Vrine for affection. "There is a sort of domestic enjoyment to be known even in a crowd, and this you had." "There has been lots of commentary on who is staying and who is staying out and this weekend will be the real test," said one senior media buying agency executive who has pulled the advertising for one major client. There is just one woman in town who can help us. (または, dialectally:) It is just one woman in town who can help us. (intransitive) To occupy a place. (intransitive) To occur, to take place. (intransitive, in perfect tenses, without predicate) Elliptical form of "be here", "go to and return from" or similar. (transitive, copulative) Used to indicate that the subject and object are the same. (transitive, copulative, mathematics) Used to indicate that the values on either side of an equation are the same. (transitive, copulative) Used to indicate that the subject plays the role of the predicate nominal. (transitive, copulative) Used to indicate that the subject has the qualities described by a noun or noun phrase. (transitive, auxiliary) Used to form the passive voice. Study courses of Esperanto and Ido have been broadcast. (transitive, auxiliary) Used to form the continuous forms of various tenses. In the possibility of radio uses of a constructed language — and such experiments are proving successful—vast sums of money and untold social forces may be involved. (archaic, auxiliary) Used to form the perfect aspect with certain intransitive verbs, most of which indicate motion. Often still used for "to go"
‘I wish that he were come to me, / For he will come,’ she said. He is not here; for he is risen […]. (transitive, auxiliary) Used to form future tenses, especially the future periphrastic. (transitive, copulative) Used to link a subject to a measurement. (transitive, copulative, with a cardinal numeral) Used to state the age of a subject in years. (with a dummy subject it) Used to indicate the time of day. It’s 8:30 [read eight-thirty] in Tokyo. (With since) Used to indicate passage of time since the occurrence of an event. (often impersonal, with it as a dummy subject) Used to indicate weather, air quality, or the like. (dynamic/lexical "be", especially in progressive tenses, conjugated non-suppletively in the present tense, see usage notes) To exist or behave in a certain way. "What do we do?" "We be ourselves." (African American Vernacular, Caribbean, auxiliary, not conjugated) To tend to do, often do; marks the habitual aspect. Women be shoppin’! You cannot stop a woman from shoppin’! When used copulatively with a pronoun, traditional grammar puts the pronoun in the subjective case (I, he, she, we, they) rather than the objective case (me, him, her, us, them), regardless of which side of the copula it is placed. For example, "I was the masked man" and "The masked man was I" would both be considered correct, while "The masked man was me" and "Me was the masked man" would both be incorrect. However, most colloquial speech treats the verb be as transitive, in which case the pronoun is used in the objective case if it occurs after the copula: "I was the masked man" but "The masked man was me". This paradigm applies even if the copula is linking two pronouns; thus "I am her" and "She is me", and "Am I me?" (versus the traditional "I am she", "She is I", "Am I I?"). *Some non-standard dialects use were in these instances. **Some non-standard dialects use was in these instances. *Some non-standard dialects will have were in these instances. **Some non-standard dialects will have was in these instances. ***It is optional to include the subject which is to be stated after the imperative. Be itself is the plain form, used as the infinitive, as the imperative, and as the present subjunctive. Am, are, and is are the forms of the present indicative. Am is the first-person singular (used with I); is is the third-person singular (used with he, she, it かつ other subjects that would be used with does rather than do); and are is both the second-person singular and the plural (used with we, you, they, かつ any other 複数形 subjects). Was and were are the forms of the past indicative and past subjunctive (like did). In the past indicative, was is the first– and third-person singular (used with I, as well as with he, she, it かつ other subjects that would be used with does rather than do), and were is both the second-person singular and the plural (used with we, you, they, かつ any other 複数形 subjects). In the traditional past subjunctive, were is used with all subjects, though many speakers do not actually distinguish the past subjunctive from the past indicative, and therefore use was with first– and third-person singular subjects even in cases where other speakers would use were. Been is the past participle, used in the perfect aspect. In Middle English, it was also the infinitive. It’s been that way for a week and a half. When the pronoun thou was in regular use, the forms art, wast, and wert were the corresponding present indicative, past indicative, and past subjunctive, respectively. As thou became less common and more highly marked, a special present-subjunctive form beest developed (replacing the regular present subjunctive form be, still used with all other subjects). Additionally, the form wert, previously a past subjunctive form, came to be used as a past indicative as well. I don’t want to be involved. —But you are involved, regardless. Several of the finite forms of be have special negative forms, containing the suffix -n’t, that can be used instead of adding the adverb not. Specifically, the forms is, are, was, and were have the negative forms isn’t, aren’t, wasn’t, and weren’t. The form be itself does not, even in finite uses, with “not be” being used in the present subjunctive and “do not be” or “don’t be” (または, in dated use, “be not”) being used in the imperative. The form am has the negative forms aren’t, amn’t, and arguably ain’t, but all of these are in restricted use; see their entries for details. Outside of Standard English, there is some variation in usage of some forms; some dialects, for example, use is or ’s throughout the present indicative (supplanting, in whole または in part, am かつ are), and/or was throughout the past indicative and past subjunctive (supplanting were). For quotations of use of this term, see Citations:be. “be” in The American Heritage Dictionary of the English Language, 4th edition, Boston, Mass. : Houghton Mifflin, 2000, →ISBN. “be” in Dictionary.com Unabridged, Dictionary.com, LLC, 1995–present. "be" in WordNet 2.0, Princeton University, 2003. 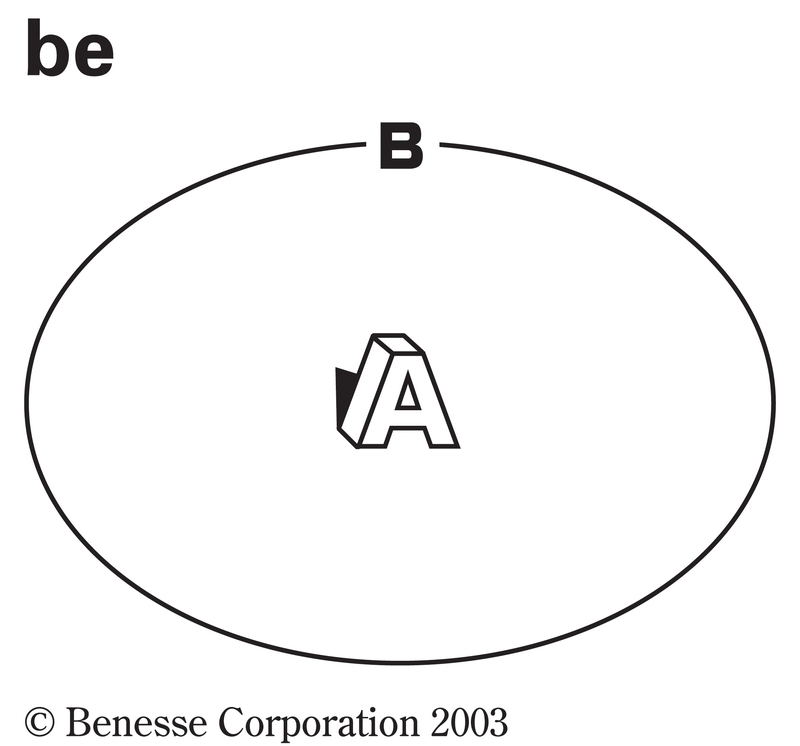 The name of the letter B. From Middle English be-, bi-, from 古期英語 be- (“be-”), from Proto-Germanic *bi- (“be-”), from Proto-Germanic *bi (“near, by”), ultimately from Proto-Indo-European *h₁epi (“at, near”). See by. Cognate with Saterland Frisian be- (“be-”), West Frisian be- (“be-”), Dutch be- (“be-”), German Low German be- (“be-”), German be- (“be-”), Swedish be- (“be-”). More at by. (rare or no longer productive) By, near, next to, around, close to. (rare or no longer productive) Around; about. (rare or no longer productive) About, regarding, concerning, over. (rare or no longer productive) On, upon, at, to, in contact with something. (rare or no longer productive) As an intensifier; i.e. thoroughly, excessively; completely; utterly. (rare or no longer productive) All around; about; abundantly; all over. (rare or no longer productive) Forming verbs derived from nouns or adjectives, usually with the sense of "to make, become, or cause to be". (archaic or informal) Used to intensify adjectives meaning "adorned with something", often those with the suffix -ed. Similarly, one could argue that if these be-tattooed yogic folk were really so spiritual, they wouldn't feel the need to inform everyone else of this or remind themselves of it, via the medium of the tattoo. An unstressed form of bī, from Proto-Germanic *bi-. .be is the Internet country code top-level domain (ccTLD) for Belgium. The domain became active in 1989 and was administrated by Pierre Verbaeten of the Katholieke Universiteit Leuven. In 2000, the control of the TLD was transferred to DNS Belgium. As of late 2005, more than 470,000 domains were registered.